Several spacecraft support systems are required to keep Hubble functioning smoothly in space. These systems are located around the body of the spacecraft and encompassed by the outer hull. 25-foot (7-meter) panels that convert sunlight into 5680 watts of electricity in order to power the telescope. Transmit Hubble's information to communications satellites called the Tracking & Data Relay Satellite (TDRS) System for relay to White Sands, the Space Telescope Operations Control Center (STOCC) in Greenbelt, Maryland, and the Space Telescope Science Institute (STSci) in Baltimore, Maryland. 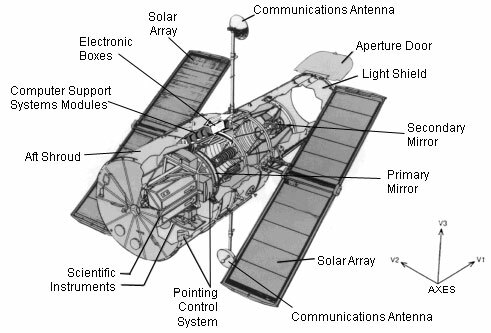 Contains devices and systems needed to operate the Hubble Telescope. Serves as the master control system for communications, navigation, power management, etc. Houses much of the electronics including computer equipment and rechargeable batteries. Protects Hubble's optics in the same way a camera's lens cap shields the lens. It closes during servicing missions and in response to certain kinds of "safe mode". Light passes through this before entering the optics system. It blocks unwanted external light from entering Hubble. This system aligns the spacecraft to point to and remain locked on any target.